Sanobar Shermatova was born in Uzbekistan. She graduated from the Russian Language and Literature Institute in Tashkent and the Moscow State University, department of Journalism, in Moscow. Sanobar was broadly recognized as the expert in Caucasian and Central Asian issues. She worked for the "Moscow News" weekly, "Gazeta", "Novosti" information agency, and contributed to "Fergana.ru". Our colleague, a beautiful woman and a renowned journalist Sanobar Shermatova has passed away untimely in Moscow, on March 7, 2011. She died of a sudden heart failure in slightly more than one month before her 60th birthday on April 13. Her death is an unbearable loss. It is a tragedy that young and active people like herself pass away. Sanobar was very considerate and soulful person, an excellent friend and a thoughtful interviewer. Author with a mastery of the Russian language, she was truly an Uzbek woman in her soul. She was very proud of it and yet very concerned with problems in her motherland, which she missed enormously and visited every year. 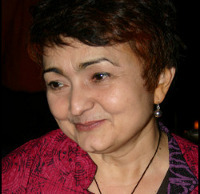 As a journalist and the expert in Uzbekistan, Central Asia and Caucasus, she gained an exceptional professional reputation and weight, particularly in the recent years. Contrast to many, Sanobar was writing of the most important things only, as she had an ability to seed deeply into the essence. "Fergana.ru" is mournful about this sudden and tragic loss and extends the deepest condolences to her children, family members and friends.